We know it's been a while since the last post. It was just such a good glimpse into why we do what we do, I thought we'd let it sit and soak in a bit. Things around here have been anything but dormant. 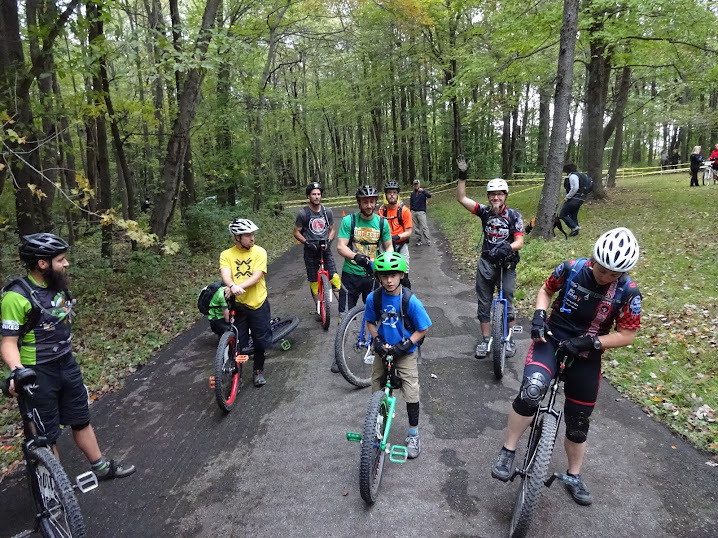 In addition to MUni Mondays we've been riding a fair amount at Moraine on the off road trails. When I say we, it means: Isaac, Nate, Steve, Connor, Seth, and myself (Dave). We're pretty much finalized on the Advanced and Expert XC courses for NAUCC 2013 and have some ideas for the Uphill/Downhill for those two categories. We all agree that the courses are challenging, but very do able. After I finish this entry I'm headed out to the Harmony/Zelienople area to scout for the Beginner courses. The Month of Mud racing series starts tomorrow. Unis are welcome at all 4 races. We usually tweak our start times a bit (earlier) to stay out of the way of the bikes on the Moraine and Ohiopyle courses. For Moraine, we'll meet at the registration area and hit the trail about 9ish. We will be most likely be doing next summer's Expert loop. It will be fun. Although we haven't been posting a ton of details about NAUCC 2013, that doesn't mean we've been busy. We just don't want to share information that isn't accurate so we've been confirming venues and events and getting details lined up. Official announcements are coming soon. In about a month (Oct. 27th) we start again at the Butler Y. If you can ride, join us. If you can't, we'll teach you (we have extra unis). By next summer you want to be proficient at unicycling. The annual NAUCC convention is a blast. You don't want to miss it. Especially if it's in your back yard.